U Ko Ni – A prominent human rights lawyer, activist and key NLD advisor assassinated at Yangon Airport. 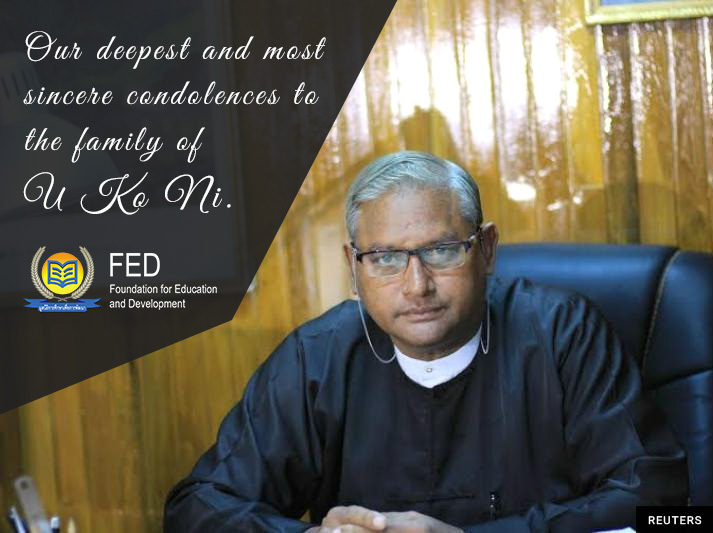 YANGON, Myanmar – U Ko Ni, a prominent human rights lawyer and legal advisor to Aung San Suu Kyi’s National League for Democracy (NLD) was assassinated at Yangon Airport. Mr. Ko Ni was shot in the back of his head on Sunday after arriving from a trip to Indonesia. A taxi driver by the name U Ne Win saw it happening and chased the attacker. U Ne Win got shot and killed during the chase. Other taxi drivers detained the attacker until the police arrived. Shortly after the event pictures on social media starting to show the attacker as he was taken in by the police. He was covered in blood from head to toe. He was identified by the police as U Kyi Lin from Mandalay, Myanmar. “It seems the gunman knew the exact time of his arrival and was waiting to shoot him”, said a member of the team who traveled with Mr. Ko Ni to Indonesia. “It is unsafe here”, he ended. As a student activist dating back to the uprising of 1988, Ko Ni has been a political prisoner, a senior lawyer, a key legal advisor, an expert on constitutional law and he worked on the NLD’s plans to amend Myanmar’s military drafted charter. Last year, during the assaults on the Muslim Rohingyas, he spoke of the need to stand up for the rights of Muslim citizens. That may have made him some powerful enemies. But so far no official motive has been given.